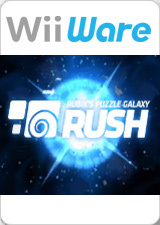 Rubik's Puzzle Galaxy: Rush is a 3D puzzle game with more than 70 challenging levels. Players need to guide Cubes to color coded exit points. Using the Wii Remote’s intuitive controls, players herd the colored cubes along by using Conveyer Belts, Warps, Stop Signs, Directional Signs and Splits. RUSH also includes the original Rubik’s Cube as a bonus. Players can attempt to solve one of the four different size Cubes alone or against a second player, or learn how to solve the classic Rubik’s Cube. The graph below charts the compatibility with Rubik's Puzzle Galaxy: Rush since Dolphin's 2.0 release, listing revisions only where a compatibility change occurred. This page was last edited on 21 July 2018, at 22:28.